Another milestone for Stanley Halls on Wednesday night: the first professional music concert in goodness knows how many years. 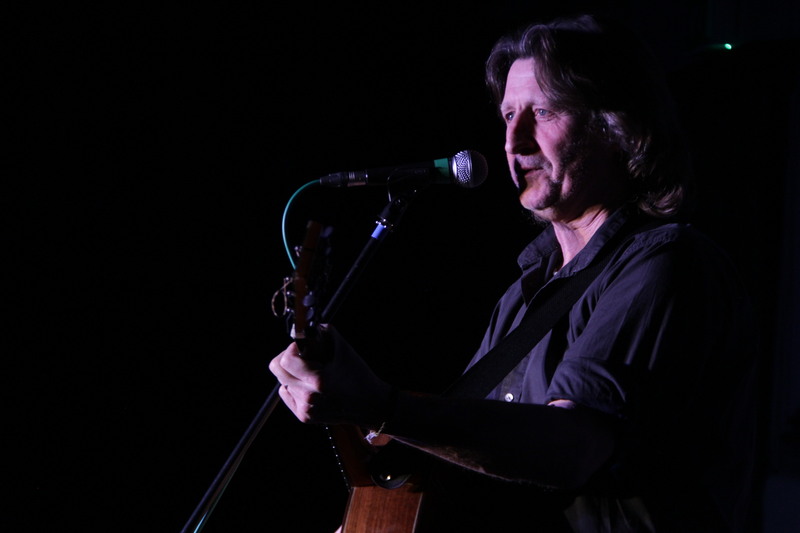 Folk singer Steve Knightley took to the stage in South Norwood. Or rather, he sang in the middle of the crowd. The capacity audience definitely took well to the intimate style and his preference for a pared-down show, with just enough staging and lights to make you feel you are having a proper night out. Steve’s poetic songs, superb musicianship and entertaining conversation took the crowd to the deepest West Country and they lapped it up. One thing they couldn’t have got in the south-west was local SE25 brew from Clarence and Frederick. A first outing for them at Stanley Halls, and from Wednesday’s evidence, definitely not the last. This was part of Knightly’s “Grow Your Own Gig” solo tour, away from his usual band, Show of Hands. More used to performing at the Royal Albert Hall or Glastonbury, our very own Stanley Halls may have seemed an odd choice for Steve, but he wanted to get among the people and sing, and is currently touring community halls up and down the country. Stanley Halls will soon be managed by a charity led by local people. The red tape has taken a fair amount of negotiating, but at last it looks as if it is really going to happen. This gig, and a few other recent events, have been council hires, but the events have been managed by volunteers from the Stanley People’s Initiative, the group taking over the Halls. So far so good – even if Stanley always seems to have a few tricks up his sleeve to test the volunteers. Wednesday saw the ladies’ toilets out of action due to collapsed drains, and the alternative disabled provision flooded as the lead had been nicked off the roof. So, four hours of scrubbing and a few bottles of bleach later, the women in the audience found they had a guided tour to their “new” facilities in an adjoining building. Many were somewhat surprised to see a row of urinals beside their cubicles. The crowd were fantastic and took it all in good spirit. The issues with the toilets and the flood will be sorted, and yes, Stanley is looking a bit “shabby chic”, but it’s part of the charm. So, who should perform next at Stanley Halls? This entry was posted in Art, Community associations, Music, South Norwood, Stanley Halls, Stanley People's Initiative and tagged Arts, Croydon, Glastonbury, Music, South Norwood, Stanley Halls, Stanley People's Initiative, Steve Knightly. Bookmark the permalink. Thanks so much for that. We have known Steve Knightly for years. Unfortunately, we were unable to go to that gig.